I thought I wouldn’t see anything as impressive as the Space Shuttle Atlantis launch in high-definition, but it appears I was wrong. 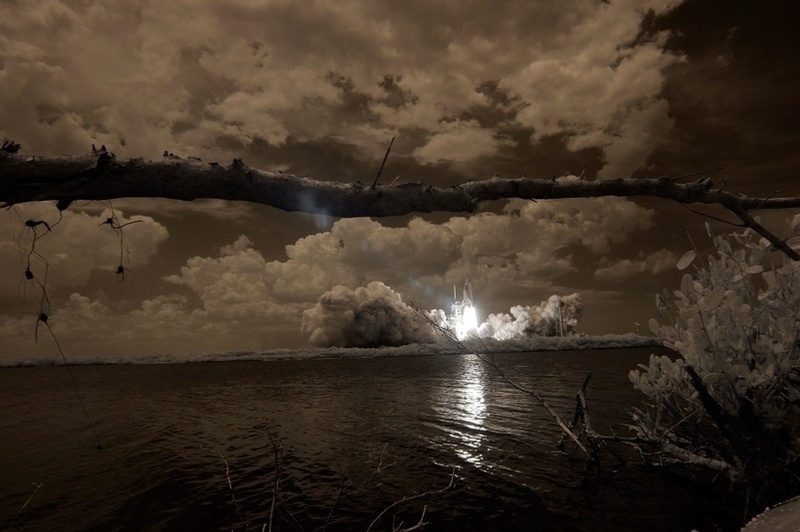 This is probably one of the most unique views of a shuttle launch I’ve seen to date; a high resolution, infrared photograph of the beginning of the STS-125 mission to the Hubble Space Telescope. This is a historic photo opportunity. Rarely do we see two shuttles rolled out onto different launchpads at the same time, but this scene has an extra poignancy to it: this is the last time two shuttles will be rolled out at the same time, ever. All set for the fifth and final Hubble servicing mission on October 10th, Space Shuttle Atlantis (STS-125) will carry the crew of seven to install two new instruments on the 18-year old orbiting telescope. They will also give the observatory an in-orbit overhaul; replacing the Fine Guidance Sensor and six gyroscopes to boost the operational lifespan of Hubble till 2013.